Before sitting down to start this sea life painting under the moon, I knew I wanted it to be very epic. Very grandiose and mystical. The use of violet and pink in the sky and water definitely helped me accomplish that. While there are leaping dolphins, the main focus is the breaching humpback whale, mighty and beautiful, shining in the moonlight. I added a lot of detail in the strands of water spilling off it's body, which also added to the drama of the scene. This big painting also contains the most realistic waves I have yet to paint with a palette knife! **This tropical whale art was painted with oils, using ONLY a palette knife! It was created on high quality cotton canvas and is stretched and ready to hang. The sides of the oil painting are painted *black* to give the art a professional look. You can hang it right out of the box! 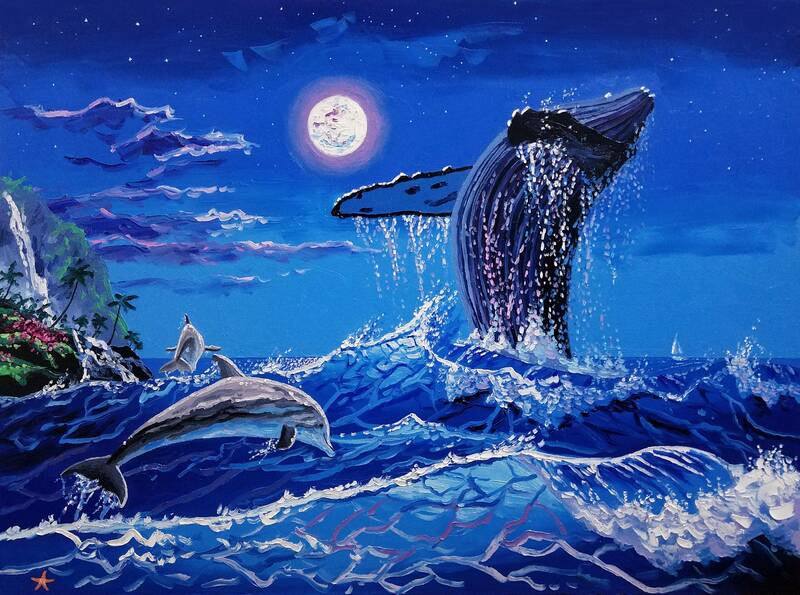 **This large marine life painting is 30 by 40 inches in size and comes with a certificate of authenticity, signed by me. The colors and rich textures of the painting make the work pop off the canvas. My 3-D style is very exciting and makes my art unique.